Hello Friends! I hope you are well. If you know me, you know I work at really odd hours. I rarely pack in more than 6 hours of sleep a night. So, that means, one can easily find me up and piddling around at 3am or 4 am, when all is quiet at my house. 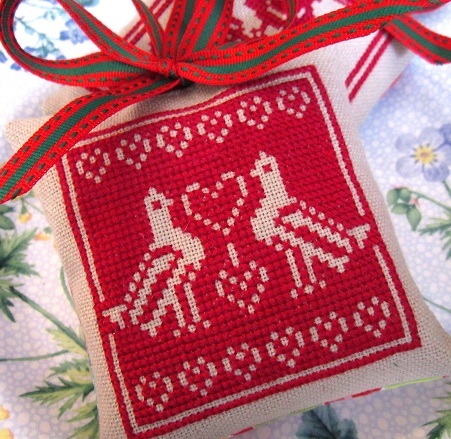 I was too sleepy to do any real work when I woke up at 3am one day last week, so I sat in my chair and finished up my “Two Turtledoves” Christmas ornament. Pattern is The Cat’s Whisker’s “Twelve Days of Christmas Series”. 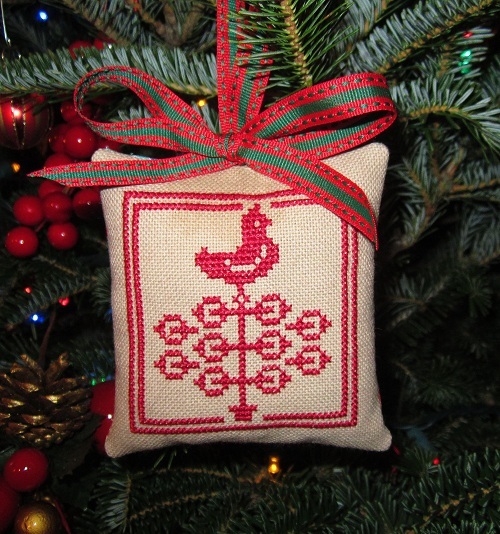 Here is a closer look at my “Partridge in the Pear Tree” Ornament that I finished up for Christmas 2012. Thanks for stopping by, Friends! Happy Monday, and Happy Week to you. 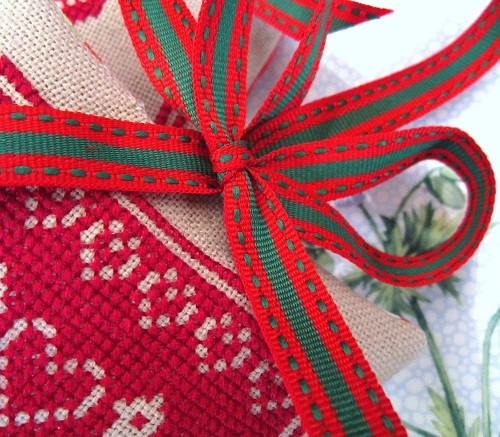 This entry was posted in Christmas, Needlework and tagged Christmas Ornaments, Cross-stitch, The Cat's Whiskers Twelve Days of Christmas ornaments. Bookmark the permalink. ← A tale of two Coxcombs! So very pretty….heirlooms for sure! Love the ornaments. Do you have a tree that you put these on at Christmas. If not you should just beautiful. Thanks for sharing. Oh, my word! Those are sooo beautiful in their simplicity. You’re a very talented young lady. Your work is simply *amazing*. Miss Baby is off to a great start. Yours are beautiful too, Wendy. I bet that you both had fun stitchin’. Beautiful ornaments. I think Miss Baby’s is lovely too! Good for your letting her stitch along with Mom. beautiful ornaments, including Miss baby’s! 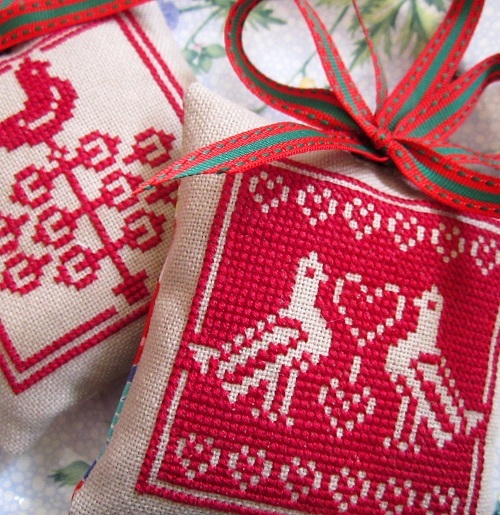 I admire people who have the patience to do cross stitch! Very nice! And so cute that Miss Baby wants to follow suit. I think we can all learn from Miss Baby – imagination is so important! And it doesnt matter what anyone else thinks about our creations because they are ours – a part of us, and no one can take that from us. Lol easy to say, harder to accept…. maybe we should all go back to visit our inner child…. I love your ornaments too Wendy! Three French Hens?! LOVE. Your Turtle Doves ornament is just lovely, Wendy. I’m not ready to think about Christmas again, though! 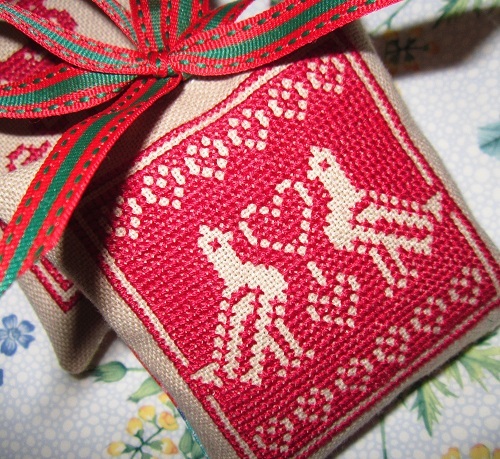 I love your cross stitch!! 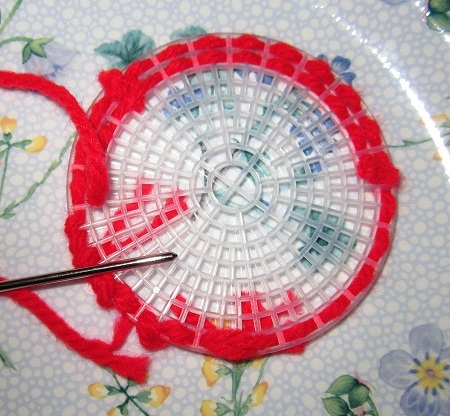 So it is okay to get up when you can’t sleep and do needlework? I, too, have done this on occasion but thought I was the only one!! Those are beautiful Christmas ornaments!